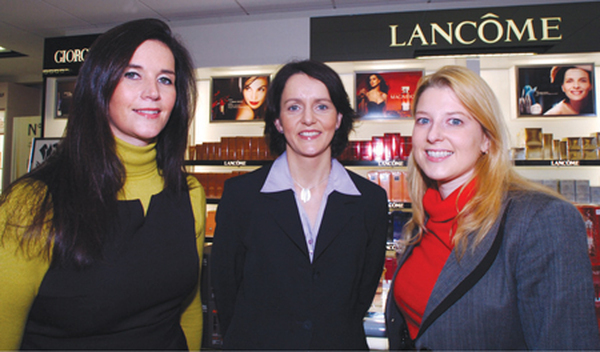 Linda Myers, Lancome regional business manager; Maura O'Gorman, pharmacy manager; and Audrey Kinahan, owner, at the University Late Night Pharmacy's newly opened cosmetic department. Picture: Philip Cloherty. Galwegians are to be offered more choice when they buy their cosmetic and beauty gifts with the opening of the newly refurbished cosmetics department at University Late Night Pharmacy. Some of the world's leading cosmetic and fragrance brands have opened counters at the pharmacy, opposite University College Hospital. The newly refurbished pharmacy now offers a complete range of beauty brands such as Lancome, Clarins, Chanel, Armani, Viktor & Rolph, Elizabeth Arden, and Jean Paul Gaultier. Dedicated skincare brands such as Vichy and La Roche Posay also feature. "We have completely redesigned and refurbished our pharmacy and are delighted to be able to offer our customers a choice of leading cosmetic and fragrance brands such as Lancome, Clarins and Chanel," said Dr Audrey Kinahan of University Late Night Pharmacy. "Customers are very brand conscious and brand loyal and our aim is to offer our customers the brands they want in a convenient location with long opening hours and expert staff." In keeping with this philosophy Dr Kinahan will have a team of experts in store including Lancome counter manager Joan Walshe, an expert make-up artist with experience working behind the scenes for television and magazine photo shoots. Ms Walshe's top tip of the day for tired puffy eyes is to mix your eye cream with your concealer — and it gives amazing results! The Clarins and Chanel counters are sure to be a big hit with local shoppers, while it's hard not to be drawn to the wonderfully chic Viktor & Rolph, whose Flower Bomb fragrance is simply heaven wrapped in a gorgeous bottle.